Boy, what can I say but 2009 was truly a distinguished year, IMHO, for movies. At least the movies that are up for Best Picture at the Academy Awards. The problem is, while this select few represent a really interesting spectrum of subjects/topics, there is really a dearth of quality movies made these days. In fact, there is a dearth of films made these days, period. Anyway, the Bug and I toddled on over to the Cinema Palme d'Or yesterday to catch The Last Station which is one of the last Best Picture candidates that we hadn't seen. Neither of us had a clue about what the movie was about. We knew only this: it was nominated for Best Supporting Actor and Best Actress and its cast included the goddess Helen Mirren and that hottie James McAvoy. I seldom read film reviews because I couldn't care less what a critic thinks of a movie. If I wish to see a movie, then I'll see the movie, critically drubbed or not. I don't watch tv. So I learn about new films and their subject matter by trailers or online or occasionally the Sunday newspaper. But I somehow knew nothing about The Last Station (actually the same was true for An Education....I only knew vaguely that it took place in the 60s). How fun is that? What a wonderful surprise we had. The Last Station is about the final months in the life of Leo Tolstoy, in early 1900's. 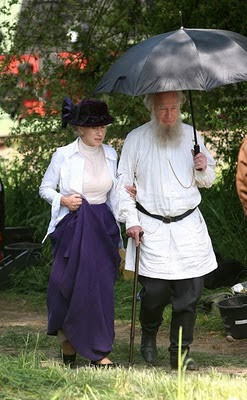 Christopher Plummer, nominee for Best Supporting Actor, portrays the master writer and his wife, Countess Sofya Tolstoy, is played in usually brilliant fashion by La Mirren (who is nominated for Best Actress). And then there is that remarkably fetching and talented James McAvoy. What a wonderful string of films he has made (my favorite film last year, Atonement, before that, The Last King of Scotland. Oh, and one of my other favorite movies, Becoming Jane). 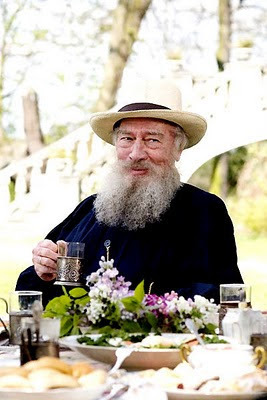 He brings an earnestness to the character of Valentin Bulgakov, who is Tolstoy's secretary (everytime he sneezes my heart breaks). This is an interesting character and I can't think of any other actor who could have brought a better interpretation than McAvoy. Valentin is an idealistic Tolstoyan, a practicing virginal celibate, who passionately believes in the tenets of the Tolstoyan Movement: brotherly love and world peace through pacifism, and a denouncement of material wealth and physical love. Paul Giamatti is brilliant as the Movement's villainous leader, Vladimir Chertkov. But this move is absolutely astonishing because of the dueling tour de force performances of Plummer and La Mirren. 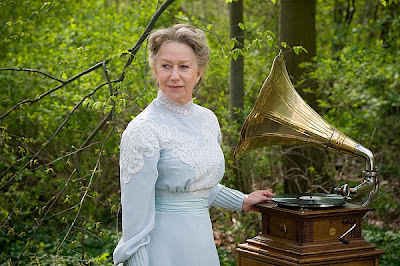 I have to say that Mirren, in my opinion, is the only other Best Actress nominee, besides Sandra Bullock, who should win the award based upon performance. I haven't seen Precious yet, will see it this afternoon. So I may have to revise my opinion. But I still think Bullock will win. Mirren already has a Best Actress and I think Bullock will win because this is her one true shot at the award and she also set such a huge example for female stars with The Blind Side, which is the highest grossing film starring a major female actress, currently at $250million (domestic). I haven't seen Jeff Bridges performance yet. He's my sentimental favorite. But Plummer should win Supporting actor........talk about a career! Father Von Trapp needs and Academy Award. 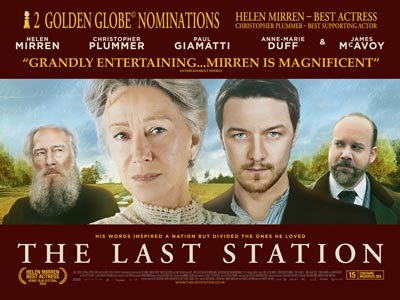 GO see The Last Station. A beautiful, magnificent film. One observation for those more well-versed on Tolstoy or Russian History. After seeing this movie, I'm wondering if the Tolstoyan Movement didn't pave the way for the Russian Revolution? Anyone have anything to add. It seemed that, as depicted in The Last Station, that the Movement was anti-religion, anti-Tzar. Given that Tolstoy was so beloved by the people, he was even considered Saint-like, that kind of power and influence would have been the only thing capable of undermining the monarchy and the Russian orthodox church. Tell me if I'm right/wrong.......Interesting thought though.